SureEdge is a fast-fit, high quality PVC-u edge trim system designed around a high quality finish and the durability to offer an extra-long life. The trim is available in either black or white and comes complete with a PVC-u Built in Batten that removes the need for a standard wooden batten. There is also a thinner back plate included which can be used to mount directly when a standard wooden batten is already in place. 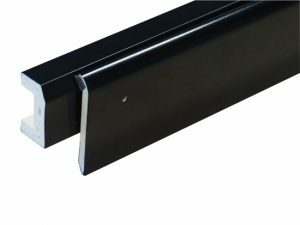 High quality, durable roof edge trim manufactured from co-extruded uPVC, the same technology trusted by the industry to manufacture uPVC solid fascia, and ready to install straight out of the box. Providing a neat, simple and fast finishing detail for the edge of any flat roof. Supplied black or white in 2.5m lengths, easily cut on site using traditional roofing tools leaving no sharp edges. The pre-drilled trims save time and improve accuracy when installing. Fast and easy to install with pre-applied water seal. SureEdge trims are solid cored for strength and removes the need & cost of additional caps used in hollow trims. Fast and easy to install with pre-applied water seal on clamping trim. Choice of ‘Built in Batten’ saving the time and cost of additional timber back plate or ‘Standard’ Back plate to be fitted to existing batten drip edge. The two part drip edge trim securely clamps the membrane by mechanically fixing and prevents warping or popping experienced with ‘clip in’ systems. The outer trim section features built in water seal to accommodate different thickness membranes, seams and detail flashings. Supplied Black or White with smooth, gloss appearance with a choice of back plate thicknesses. Both the gutter and check kerb trims have joiners, internal corners and external corners to allow for all roof details. 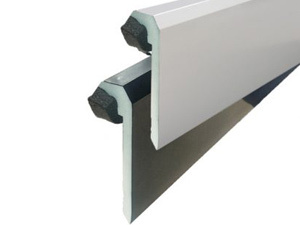 The joiners simply clip into place, made from the same gloss finish uPVC, creating a neat, seamless appearance. Both the gutter & check kerb have external corners details in both black & white. 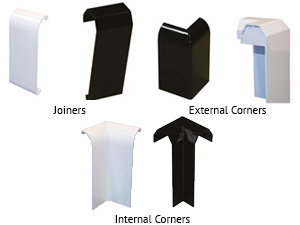 These components make the detailing of roof perimeters fast and easy without having to make any compromise. Both the gutter & check kerb have internal corners in both black & white. These components make the detailing of roof perimeters fast and easy saving the need & time of trying to manufacture neat corners on site. Corners are either glued or fixed in position.